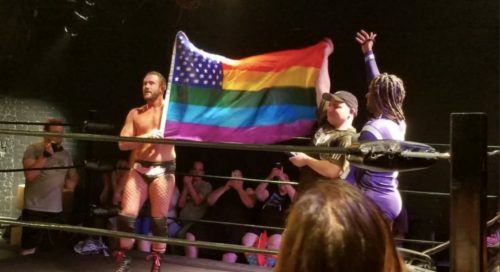 Professional wrestling in America has a long and homophobic history filled with flamboyant villains but very few out-and-proud LGBTQ-identified athletes. Rick Cataldo wants to change that. Inspired by female wrestlers he saw growing up, Caltado dropped out of high school at age 14 to start working a busboy and training twice a week to become a pro wrestler. He didn’t care about becoming an Adonis—he wanted to become a character that would allow him to embrace his queerness. A recent promo image for A Matter of Pride Wrestling. Cataldo “The Boy Diva” is the blonde in the top row-center. When he first started wrestling, a lot of promoters and bookers, didn’t take Caltado seriously. “They thought I didn’t belong in the ring,” he says. “They thought I was a waste of time.” When he was booked, other male wrestlers saw his gender bending as an unwelcome disruption to their jock atmosphere and would throw his gym bag out of the ring. While Caltado worries about costume malfunctions, no-show performers and injuries during his Matter of Pride events, he also puts on a good show filled with wrestlers in drag, female wrestlers, mixed gender matches and tough heels and babyface jobbers (that is, brutal villains and handsome punishment sponges). Dixon started off as a very masculine wrestler. But as he got a reputation for being tough in the ring, he gradually felt more comfortable embracing his femininity in the ring. Fellow Matter of Pride wrestler, WWE competitor Diva Melina Perez, says female athletes in pro-wrestlers also face discrimination and marginalization somewhat similar to queer wrestlers. They’re often pushed out in favor of male wrestlers and treated as a novelty. Even if you don’t like wrestling or violence, it’s still kinda jaw-dropping to see these queer athletes doing super heroic moves and allowing others to see their larger-than-life authentic selves.